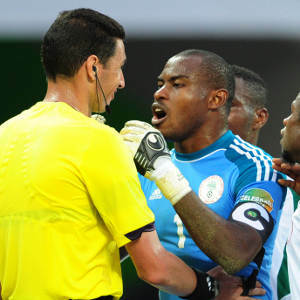 Super eagles of Nigeria goalkeeper and stand in skipper, Vincent Enyeama, has played down talks about his record of never losing in any quarterfinal match at the Afcon he has appeared in. Enyeama was in goal throughout as Nigeria's Super Eagles tripped tournament favourites, the Elephants of Cote d'Ivoire, by 2-1 in Rustenburg in a quarterfinal game at the Africa Cup of Nations on Sunday. The 30-year-old goalkeeper when asked about his record of never losing in the quarterfinal of the Afcon he has taken part in his country's squad said: "I don't know how it happens as I'm not the Special One." He further said: "I can only thank God for all of the achievements as I don't care about statistics." Nigeria proved all the pundits and doubters wrong today in quarter final three by upsetting the star studded and much fancied Elephants of the Ivory Coast 2-1. From the opening whistle the Super Eagles showed that they would not be intimidated and took the fight to Africa’s top ranked team. Using flank play as well as a solid defending Nigeria proved to be more than a nuisance relying on Moses and Emenike who blew at least two solid chances to take the lead. They were finally rewarded when Emenike shot them ahead with a monster free kick that has to be in contention for goal of the tournament. The second half saw the Ivorians come out with more urgency and after a suspect call in favour of Drogba they converted the resulting free kick through Cheick Tiote and the game was tied at 1-1. That seemed to breath life into the Elephants who now turned it on and only a superb save by Enyeama stopped APOY Yaya Toure from giving the Ivoirians the lead in the 66th minute. And then with 12 minutes left came the goal of the game from the Enugu Rangers Star Sunday Mba who waltzed all the way through the Elephants midfield and unleashed a salvo in the 78th minute that saw Nigeria take the lead for good. The Super Eagles Nigeria faces Mali in the first semi final.